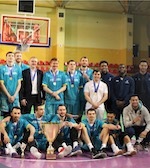 Kazakh defending champion BK Astana (National League) landed 28-year old American forward Ken Horton (202-90kg-89, college: Central Connecticut State). He played most recently at Pau-Lacq-Orthez in French ProA. In 35 games he averaged 11.9ppg, 5.3rpg and 1.3apg last season. The previous (16-17) season Horton played at Telekom Baskets (BBL) in league where in 33 games he had 10.8ppg, 6.0rpg, 1.6apg and 1.3spg. It was a very successful season in his career as he was selected to Eurobasket.com All-German Bundesliga Honorable Mention and League Player of the Week. Horton also played 15 games in FIBA Europe Cup where he recorded 14.7ppg, 6.0rpg, 1.1apg and 1.4spg. 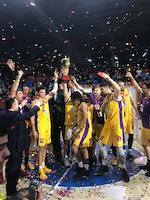 He helped them to make it to the FIBA Europe Cup Semifinals. He can count that season as a very successful as was selected to Eurobasket.com All-FIBA Europe Cup Honorable Mention. Among other achievements Horton received NABC Division I All-District 18 1st Team award back in 2011 and 2012 at his college time. Horton is a very experienced player. And here thanks to pro basketball he experienced life in six different countries playing on four different continents. He is familiar with European, Latin American, Australian and of course North American leagues. Horton has played previously professionally also in Australia (Ballarat Miners), Cyprus (Apollon), Finland (Joensuun Kataja), Mexico (Huracanes) and Germany (BBC Bayreuth). He attended Central Connecticut State until 2012 and it will be his seventh season in pro basketball.